Good Morning CEWTNK!! Today I have Jaz with me and we are going to talk about some scrumptious first kiss action in his great book series staring Katrina and Caleb. If you like to check out a review of the first book, Sunrise at Sunset (love the title) click http://closeencounterswiththenightkind.blogspot.com/2012/02/sunrise-at-sunset-by-jaz-primo.html. I really enjoyed the first book and can't wait to dive into the next one!!! LOL...and as many of you know Jaz comes strolling in with his own soundtrack...so take it away Jaz!! "Walked into the room you know you made my eyes burn; It was like, James Dean, for sure..."
"I will love you till the end of time, I would wait a million years; Promise you'll remember that you're mine..."
Once again, it's that magical time of the year when pucker factor has more to do with prospects for a romantic interlude than the sticker-shock from the dozen red roses that are helping to mark the day. To me, one of the most remarkable things about Valentine's Day is the allure surrounding that first kiss. 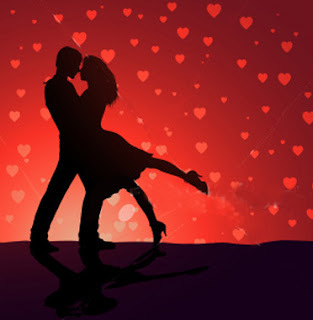 Even if it's not between you and that "special someone" but rather the central characters in the paranormal romance novel that you're reading, or perhaps the stars of a romantic film that you're absorbed in, it's likely that you're captivated by the first kiss. But what's so special about that noteworthy moment that captures our imagination? "The light in your eyes; Well it’s pulling me in...Yeah, it’s pulling me in..."
"It only comes in waves, and then it goes away; Well it must be chemical..."
Kissing is as much about brain chemistry as it is about physical chemistry. The pheromones and endorphins surrounding the laws of attraction between two people is one of nature's most complex, yet potentially gratifying, experiences. Yet, combine that intangible thread of attraction with the fulfillment of personal anticipation or longing, and the first kiss becomes a magical Hollywood-like moment that we would each like to experience again and again. For my Sunset Vampire Series, the "first kiss" moment happens between Caleb (the human) and Katrina (the vampire) in the first book of the series, Sunrise at Sunset. However, the accomplishment of this momentous endeavor wasn't as seamless as Caleb would have liked, and required a second attempt to complete it. It is for that reason that I present the following two events: the Almost First Kiss and the eventual First Kiss moments. She bent her free arm up on the table and propped her chin on her hand as she smiled at him. He swallowed once and moved his face closer to hers. It felt like an imaginary string was pulling him to her as he gazed into her penetrating stare. She slyly smiled like a predator that had snared its prey and was relishing the catch. As their lips almost touched, their meal abruptly arrived with the appearance of their server. Maybe it was the way she looked at him, or perhaps it was the sound of her voice at that moment, but no matter the reason, Caleb felt an immediate urge to kiss her. And unlike the night at the restaurant, he leaned his body towards her without hesitation until his face was nearly touching hers. She didn’t move an inch as his mouth neared hers. He ever-so-gently brushed his lips once against hers. There was warmth as their lips touched, and his eyes softened as his face hovered before her. Katrina listened to Caleb’s accelerated heartbeat and felt his warm breath against her lips. She was feeling extremely satisfied with how he had conducted himself. Now she understood his intentions even better than he probably did, and it pleased her. Her right hand went immediately and gently to the back of his neck, where she cupped the base of his head, and her lips pressed with firm, deliberate pressure against his. She drew deeply against his breath for a single passionate moment, and he responded with a shudder that went through his body as he returned her kiss in kind. "Every night, the stormy night, away she flied...and dreamed of Paradise..."
Well, it's about time for me to go, folks. My sincere thanks to Nikki for inviting me to share in a Close Encounter With the Night Kind today! 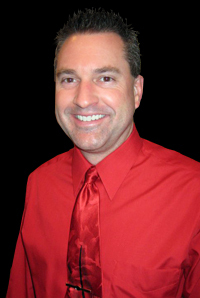 *wink* I hope that each of you have an excellent, romantic, and satisfying Valentine's Day. And if you're one of the fortunate few who experience that first kiss, may it be all that you have hoped for. For the rest of us, find that special partner in your life and just "pucker up." 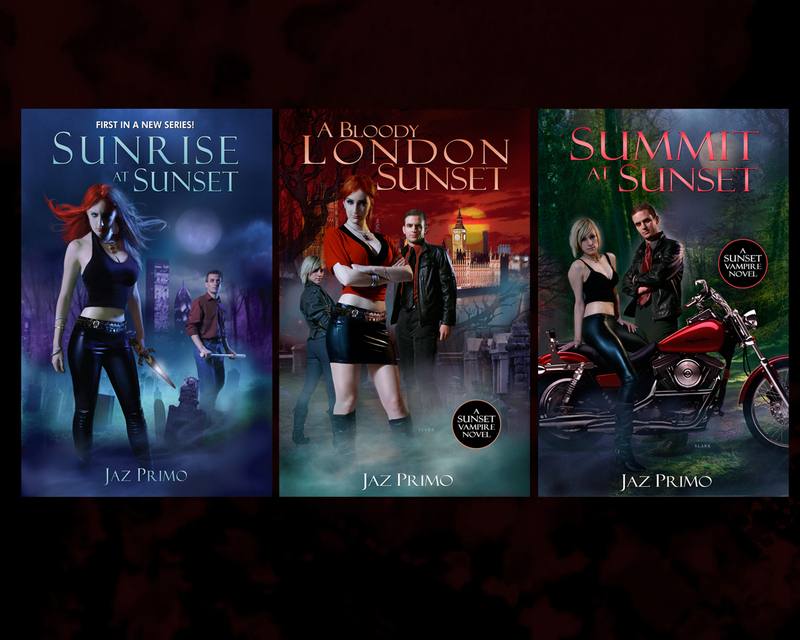 I also hope that you'll consider reading my Sunset Vampire Series. The third novel, Summit at Sunset, was just released on January 31st. (Below is the teaser from the novel's back cover.) All my best to you! + Also in the APPLE iBookstore for iPad/iPhone! A big thank you to Jaz for coming on!! I love having him here!! What a great post, Jaz! And great kisses to go along with the *soundtrack*. Always love that! Wishing you the best with your series! @Regan: Thanks so much, Regan! Glad that you like my blog-soundtrack. lol I really appreciate your friendship and support! @Desi: Thanks for your supportive comments and well-wishes! @Nikki: Thank you so much for the opportunity to reach out to your readers!